Pickup trucks are the right tool for most jobs. If needed, accessories can be installed to ensure that. A modern pickup is reliable, powerful, and versatile while remaining comfortable and easy to use for the operator. Just like our modern MIG welders. Some gasless-only welders are promoted as MIG. But these only run flux-core wire and lack the versatility and ease of use features found in a full MIG machine. A MIG welder will help to get a beginner making solid, effective welds fast — much sooner and easier than with any other type of welding machine. You’ll have your new MIG welder ready to weld within minutes of unboxing. It’s that easy. See for yourself in this basic MIG welder setup video from Lincoln Electric. With just a little practice, you’ll start making simple repairs and projects. Industrial manufacturers value MIG welding for it’s adaptability to automated processes. The makers of MIG welders use this same adaptability to design consumer machines packed full of features that assist beginners learning to weld. Spend a little time with a good welding book and watch a few how-to weld videos like the one above. Then, gather some scrap metal pieces, set up your new welder, and start welding. After some trial and error, you will get the hang of it. Continue reading to see how many features of MIG welders and the MIG welding process come together making MIG the best welder for beginners learning to weld. 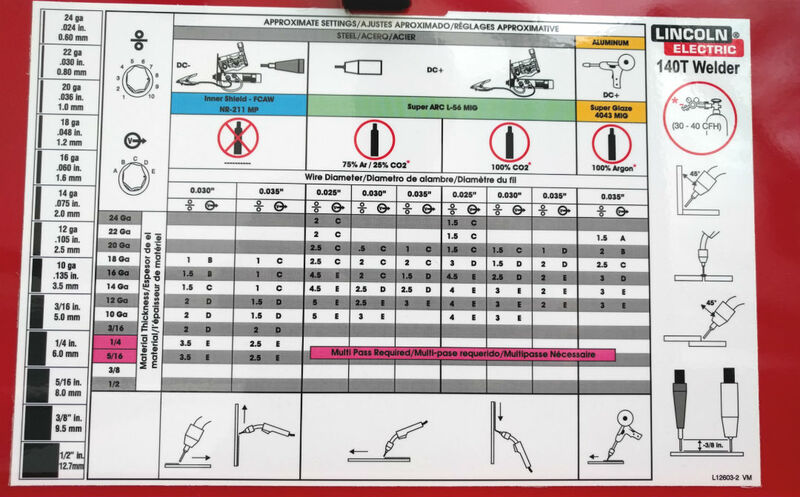 Weld settings chart found for the Lincoln 140T MIG welder (click to enlarge). 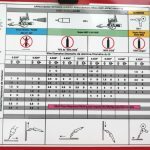 You’ll find a settings chart on the side panel of basic welders. Find your material thickness and scan across the table to see the options for gas or no-gas settings with different wire sizes. Use the front panel controls to set initial values for voltage (heat) and wire speed (amperage). Easier yet, advanced MIG welders let you input the material information, and the machine makes the voltage and wire speed adjustments for you. Welding beginners, as well as more advanced enthusiasts, will appreciate this feature. See a demonstration of the Miller Auto-Set interface in this video. If the initial settings are not quite right, you can make small adjustments to the wire feed control to fine-tune amperage. Use the voltage control to make more significant changes. With a little practice, this procedure will become second nature. Advanced synergic welders enable simultaneous tuning of amperage and voltage settings through just one control knob. The Forney 140 MP is an affordable synergic welder helping beginners focus on their welding techniques. Some types of welding require scratch or lift start techniques to initiate the arc that begins a weld. Some skill is needed to get the arc to fire, and fire in the right place. With MIG, you’ll position the torch over the workpiece. Pulling the trigger sends the energized wire electrode into contact with the material. As the circuit completes, the welding arc is established. The best welder is easy for a beginner to use. With MIG, unlike other welding methods, you don’t need to control the filler material, or the power output while welding. The welding machine handles these responsibilities so that the beginner can work on their skills. Advanced inverter-based MIG welders use microcontrollers to monitor arc performance as you weld. The welding arc is continually fine-tuned to obtain the best weld results. They can even compensate for a fair amount of operator error, such as unsteady travel speed and distance from work. You’re free to focus your attention on learning to control the weld pool. You’ll do this by regulating the gun orientation and travel speed. In other words: you’ll watch the weld pool and control what’s molten when, and for how long. This ability is vital to making a sound, uniform weld. No one is born with this skill, but anyone can pick it up through practice. Most MIG beginners make quick progress because they can focus on a single task, making the learning process more enjoyable. Since a beginner must learn to control the weld pool, it’s necessary that you can see it. MIG welding with gas produces an arc with few sparks and little smoke — much less than stick welding — giving you an excellent view of the weld. The better you can see the weld pool and observe the effects of any adjustments or technique changes you make, the sooner you’ll learn to make better welds. MIG welders release a protective gas over the weld preventing contamination that would otherwise cause porosity (air pockets) and weaken the weld. So the MIG process can help make even your less-than-pretty beginner welds stronger. At least strong enough for the type of light projects and repairs most beginner welders take on in the learning stage. As you continue to work on projects and practice, you’ll soon notice your welds begin to look better. With more uniform beads and penetration, your welds will hold up to more substantial projects. Welding with gas results in very little spatter, and no slag, for easy cleanup. But if spatter becomes a problem, here are some tips to reduce MIG spatter. With more time spent welding, a beginner’s skills will improve more quickly. Burn back timers, 2T/4T switches, and memory presets, are only a few of the handy options making the best welders for beginners easy to learn, productive and enjoyable to use. Providing excellent results on very thin (18-gauge) auto body panels, home-use MIG welders are also effective on moderately thick materials, with some machines capable of welding metal plate up to ½-inch in one pass. Get your best welds while indoors, using gas, or even outdoors in a light breeze. Use a screen to prevent the shielding gas from blowing away, leaving your weld unprotected. If conditions are too windy for gas welding, or you’d just prefer to leave the bottle in the shop, a quick switch to flux-cored wire gives you a very mobile outdoor welding setup. Many of the best MIG welders weigh under 40 pounds, with some even less than 30 pounds. Lightweight and compact, these are easy to move to a work area or lift to a storage shelf. While MIG welding with gas requires very clean materials, a switch to flux-core wire lets you make strong welds on metals with light rust, paint or grease. Just what you’re likely to find on outdoor equipment and fences. Once a beginner can control the weld pool on horizontal surfaces, vertical and even overhead welding becomes possible with a MIG welder. Many affordable multi-voltage MIG welders are now available. So, if you don’t have access to 230V power, you can learn to weld using your existing 115V outlets. When the time is right to upgrade your shop’s power, your multi-voltage welder will be ready for 230V. Most of the better MIG welders are spool gun ready, providing an easy upgrade option for trouble-free welding of your aluminum projects. For a top-quality beginner MIG welder with spool gun capability, see our Lincoln 140 review. For the ultimate in welding versatility, many multi-process welders such as the Multimatic 215 Multiprocess Welder are also multi-voltage capable. Because most buyers have just one or two projects in mind as they purchase a first welder, many underestimate how useful these handy machines can be. Some choose an inexpensive gasless or stick welder, only to later regret the limitations or difficulty of use. For the type of work hobby and DIY beginners will encounter, the easy to learn, versatile, and upgradeable MIG machine is the best welder for beginners. Choose the right welder now, and it could be the last you’ll ever need to buy.